marc provides access to inexpensive printing. We have a full range of equipment to enable the majority of print jobs, A3 posters, flyers, booklets, stationery, annual reports. If it will fit on an A3 sheet, we will probably be able to print it. Spot colour (one or two colours) can be printed using soya based inks. "Green" Full Colour Printing can be produced on our Full Colour Ink Jet Risograph. Near photographic full colour printing is done using our laser printers. 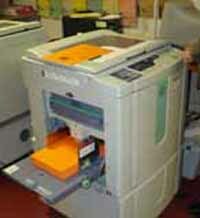 We offer a quick and inexpensive printing service for businesses and individuals. Whether you need letterheads, newsletters, business cards, annual reports, posters, flyers or CD covers, get them printed at marc. Using our environment-friendly printing machines is ethical printing at its best. 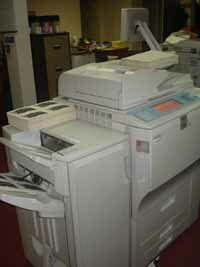 We do have a colour digital printing machine for those occasions when only near photographic full colour will do. Support your independent local printer. Service printing where the marc staff do all the work and charge for their labour. We prefer our customers to use our environment-friendly print processes on recycled papers and card, but we do have a full colour digital copier for when nothing else will do! Community Groups, charities and other voluntary sector organisations can become members of marc. 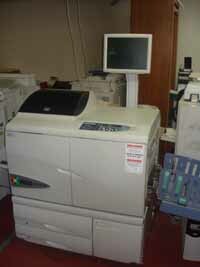 This entitles the group to a 5% discount on printing and finishing work. Marc is managed by a committee elected annually from within the membership. If you wish to do printing for a community group, charity or other voluntary sector organisation, you can book one of our Spot Colour Risograph machines and print it yourself. (DIY printing). This avoids all the charges for staff labour and makes printing very inexpensive. Professional help is always on hand to lead you through the printing process. You can also use our finishing equipment to produce booklets, guillotine paper and card, or fold your finished printing. 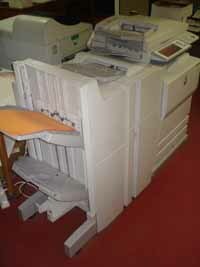 Spot Colour Risograph printers are the modern equivalent of the old duplicators. Today they are clean, easy to use and produce a much better quality finished product. They use soya-based inks and we have a very wide range of recycled paper and card. This is ethical printing at its best. You must book DIY printing in advance, in person or by phone (not by email or fax!) - it is only available on Tuesdays, Thursdays and Fridays and to bone fide voluntary and community groups. Our full-colour inkjet risograph printer and our laser colour printing cannot be done as DIY.